After two years of making the playoffs, it was obvious that last year's Texas Stars squad was disappointed in their play, not only missing the playoffs but placing last in the conference. "I'm not going to say you take it for granted, but you just expect it to happen every year," said Colton Sceviour, reflecting on his first two years in Austin. "A year like last year put it in perspective. There are guys who have gone fourteen years in pro hockey and never seen playoffs." Travis Morin had a great statistical year last year despite the down season and credits the Stars improved play this season to their consistency of systems play. Last year's team got behind the eight ball quickly, and things got a little frantic as a result. "We tried a lot of things [last year]. That just might be the fact that we were losing. You're going to look for other things when you're losing." The only constant in the systems was change for the 2011-12 squad and that made it difficult to ensure everyone was on the page and also difficult to bring in new guys quickly. Morin pointed to a few big changes that brought a lot of success to the Stars this season, "Trying to stay on the other team, rolling four lines where we try not to give the team any time off to relax. We're going to be on them, pressuring them. That's been a huge key for us to get our game where we're in good enough shape to play 60 minutes at a high tempo." "The fact we've been more aggressive in the offensive zone in turning pucks up in the neutral zone and getting back on the offensive when we do turn pucks over. It's kept teams on their heels at times." Those systems have been essential to bringing in new players, whether they be from Idaho or on PTOs. The Stars actually used more players this season (47) than they did last year (44). However, that relatively high number of 44 was cited as one of the reasons why Texas had a lack of success last season. With constantly changing bodies, it was difficult to get everyone on the same page. With a year to reflect, the changing systems were a large part of the problem as well. 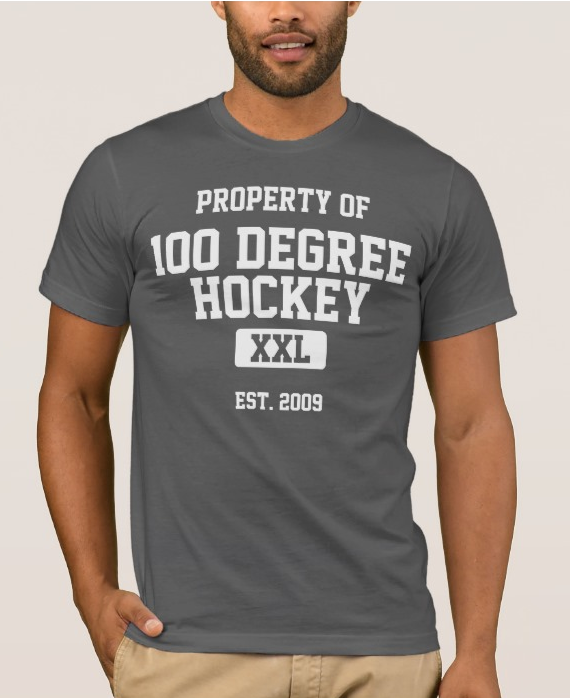 How else could Desjardins have kept 47 different players all playing 'Texas Stars hockey' from game one to seventy-six? "It helped this year with so many guys coming in. It's easy when you have guys who have all been on the same page for a while." 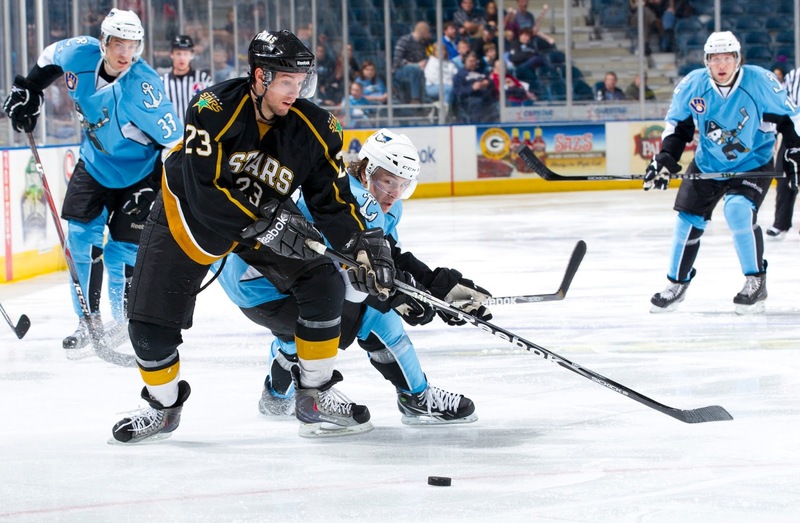 Looking further back, Morin draws some comparisons between this team and the inaugural club, which went to the Calder Cup Finals. "I think they're two different teams. We were built on defense [in the inaugural] year. Goaltending was big for us. We played games to limit the opportunities of the other teams, limit the other team to 20-25 shots. This year we have a lot of offense and guys who can put the puck in the net. It keeps it hard on the other guys playing defense all the time." 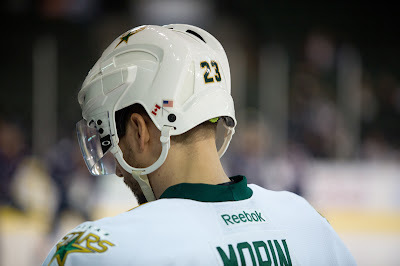 Having thirty AHL playoffs games under his belt (all in a Stars uniform), Morin is just looking to lead by example. His seven goals and sixteen assists in that time would be a fine example for young players to emulate. "I go out there and try to keep a level head and not get too up or down. You have to keep an even keel and remind the young kids that that's how you play. Playoffs are a roller coaster." And that roller coaster starts Friday. Great stuff. I feel like this has been Morin's team since 2010-11.